What if Siri were really good at what she does? What if she not only got your movie times right but got your moods as well? What if she cared for you, and what if that caring was so fine-tuned and predictive that it actually came to resemble love? That’s the premise, or one of the many interlocking premises, of The (curious case of the) Watson Intelligence, a new play by Madeleine George that’s both marvelous and filled with marvels. The Siri-like character, taking male form here, is one. He is the creation of a programmer named Eliza, who previously worked on IBM’s Watson project. Watson, you recall, was the supercomputer named for IBM founder Thomas J. Watson that defeated two Jeopardy! champions in 2011. Eliza’s version is a huge improvement on that prototype: He looks and nearly acts like a shy, thoughtful boyfriend. Still, he is not yet fully programmed, often defaulting to hilarious formulas like: “I don’t think I understand what you mean, but I’d like to. Can you give me a nudge in the right direction?” The direction in which Eliza half unwittingly nudges him is romance, in part because she misses her ex-husband, Merrick — who is likewise obsessed with Eliza, and has hired a tech nerd to spy on her. This shy and thoughtful man makes a terrible private eye but looks exactly like Eliza’s manbot, and his name happens to be Watson. If you are bothered by the coincidence, get off the train now. There are many more stations on that line. One of the things George is playing with, in fact, is the nature of randomness. Is a series of events “merely a collection of unrelated trifles” or does it, of necessity, imply a pattern? In the Stoppardian world of The Watson Intelligence, patterns are everywhere. The scenes involving the modern-day Eliza, Merrick, and Watson alternate with scenes involving earlier, related iterations of their characters. In one parallel story, Watson is Sherlock Holmes’s dimmish sidekick; he pretends to be the great sleuth himself in order to solve a mystery involving a mad inventor named Merrick and his unhappy wife, Eliza. (This Merrick is trying to create an automaton version of his wife so he can enjoy the pleasures of marriage without its annoyances.) In another, Watson is Thomas A. Watson, the engineer who in 1876 built the prototype telephone for Alexander Graham Bell and was the recipient of the inventor’s famous first communication on it: “Mr. Watson — come here — I want to see you!” That’s assuming he really said it; many years later, in an interview with one Eliza Merrick at Bell Labs, Watson claims that Bell was misquoted. Three actors play all the characters: Amanda Quaid the Elizas, David Costabile the Merricks (and Bell), and John Ellison Conlee the Watsons. They’re excellent and, under Leigh Silverman’s bracing direction, pull off a good deal of magic in their quick changes. Conlee especially is adept at distinguishing and fully inhabiting his four incarnations, despite their being variations on the same theme of a trustworthy, good companion. When he’s onstage as one of them you often find yourself wondering if one of the others might enter the scene, forgetting that this would be impossible. Nevertheless, as the stories knit, some passages are difficult to follow. A political subplot touching on both the Tea Party and the social safety net seems a bit pro forma, and the material about Bell’s Watson, while thematically crucial, is dramatically inert. But don’t let any of that scare you off; they are relevant difficulties. Just as Eliza’s “emotionally intelligent” robot requires a certain amount of programming, so do audiences experiencing new kinds of stories. And George’s cleverness keeps taking surprising turns; just when you think you’re heading into the cul-de-sac where speculative fiction typically gets trapped, she blasts her way out. The pleasure is that, in this “play about others” (as the subtitle goes), she does it in such human, dramatic terms that the distinctions between real and artificial intelligence, and among the three stories, begin to disintegrate. Tools, phrases, and obsessions echo through time. “We all suffer from moments of insufficiency, in which we must look to others to supplement our strength,” say both Holmes’ Watson and Bell’s Watson quite movingly in the course of the play. “That is no weakness, it is the first condition of human life.” Indeed, the search for ideal companionship is eternal. By the time Eliza confesses to her manbot the virtues of her real man — “his learning curve is insane … he always knows what I want” — George has shifted our thinking from the humanlike qualities of androids to the androidlike qualities of humans. Perhaps our friends and lovers and trusty sidekicks are, in a way, programmed like computers, engineered for our use and pleasure. We don’t call them “connected” — and even “thoughtful” — for nothing. 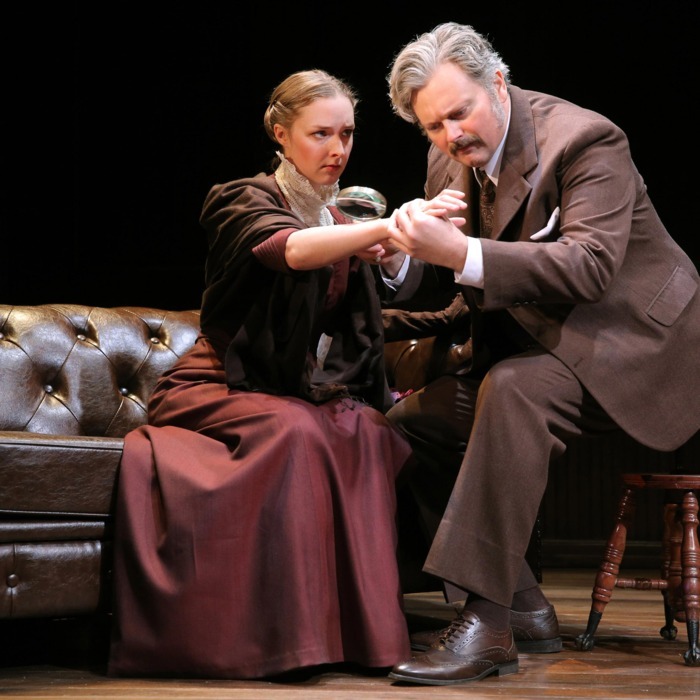 The (curious case of the) Watson Intelligence is at Playwrights Horizons through December 29.